I have a soft spot for lesbian teen fiction. Mostly because I feel like it’s a really important niche. It’s when many people first start coming out or questioning their sexuality, and it is really reassuring to be able to see a representation of yourself in fiction, especially one that reassures you that it can be okay. Unfortunately, the list of lesbian teen books is quite short. (Good Lesbian Books has a good list.) So I was excited to get another lesbian teen book to review, especially one that is from a bigger publishing company that has the chance to be more widely distributed. Hour 16: I like it! Jesse’s parents are awesome, and I can’t help but love her anti-assimilative little queer self. Hour 17: I’m still really enjoying it, but oh, the angst! Not in a write-dark-poetry way, just in an overwrought teen relationship way. Emily, why can’t you see that being with Jesse is worth risking your reputation? WHY? Hour 18: Now there’s an anti-Walmart subplot! Who doesn’t love that? Hour 19: I take back what I said before! Jesse, can’t you see she’s wrong for you? WHY? It really captures the drama of high school romance, where everything is high stakes and rollercoasters of emotion. It was also interesting to read a lesbian teen book that isn’t so much SOULMATES FROM FIRST GLANCE as it is a more typical high school relationship, which may be very emotional, but is unlikely to last forever. I really loved the main character, Jesse, and her activist, weirdo tendencies. I haven’t read a lot of teen books that have main characters that didn’t fit in because they choose not to fit in. Because they really are weird, not just “uncool”. What can I say, I related to her. And I’m a sucker for an anti-capitalist subplot. The writing was also compelling. Malinda Lo posted about the excellent kissing descriptions in The Difference, and I have to agree with her. I stopped and read out a different kissing passage to my partner when I read it the first time. I think I will finish the review with it to entice you to pick up The Difference Between You and Me, because if you haven’t noticed, I really enjoyed it. Emily’s face, so sunny-cheerful in everyday life, so bright and cute and alert, deepens and darkens when Jesse is kissing her. Her eyes fill with smoke and fall half closed, her cheeks flush. Sometimes she slurs her words. A lazy, wicked expression comes over her face, like she’s a little bit hungry and a little bit dangerous—good for nothing, ready to do damage. She can stop Jesse’s heart when she looks at her like this. 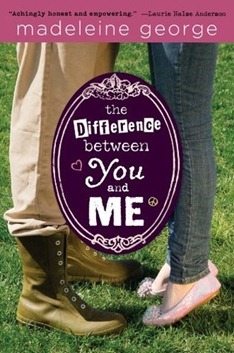 This entry was posted in Lesbrary Reviews, Uncategorized and tagged danika, Madeleine George, The Difference Between You and Me by danikaellis. Bookmark the permalink. Excellent post. You did entice me to pick up the book and go to Malinda Lo’s blog on writing kissing scenes. Never thought about what makes a good one vs. not so good. I liked how you both broke it down to see why some work so well. Now I need to get both “The Difference Between You and Me” and “Ash”. Thanks also for the list from Good Lesbian books. I want to add a YA book to our library of audio books asap. Your review will help with a selection. I’m glad! They are both definitely worth reading. Looks great! The world definitley needs some more lesbian YA novels. I’ll check it out for sure. For sure! Especially well-written ones. Thanks, Lee! I love your blog.